Foot pain is more than just a nuisance. Ongoing foot discomfort and dysfunction can keep you from doing the activities you love, not to mention those you need to do! Treatment with over-the-counter NSAIDs and rubs may become costly while having little or no effect on your pain. Meanwhile, you have no choice but to use your feet daily, to get on with your life. Your feet do more that help you stand and get around. They form a critical foundation upon which your entire body relies. As a base, you feet govern posture and balance, and provide stability for your entire body. The soles of your feet enable your ankles, knees, hips, and spine to function at their best, pain and injury free. Ignoring foot pain and allowing it to go untreated can set you up for debilitating injury, not just to your feet, but to the joints and muscles of your legs, hips and pelvis. Poor balance from compensating for pain can even set you up for a fall that leads to upper body or head injuries. Invasive therapies like corticosteroid injections and surgery may or may not get rid of your pain. However, even if they do succeed, invasive interventions do not address the underlying issues that led to your pain to begin with, and you may find yourself in a similar or worse condition later on down the road. When you correct and eliminate the underlying cause of your foot pain, you also protect other joints throughout your body from injury. While strategies like ice and rest may help ease foot pain, the ultimate solution is to seek corrective treatment. A physical therapist will do a thorough analysis of your medical history, lifestyle habits, posture and gait. They will ask questions about your daily activities, footwear, and the types of physical activities you regularly engage in. 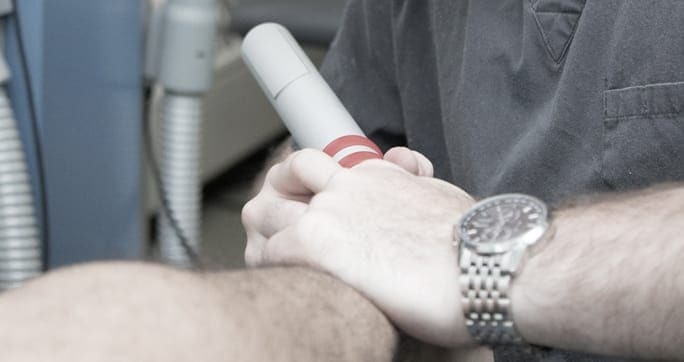 Diagnostic ultrasound may be employed to further understand the source of your pain. Once the cause of your foot pain is identified, a treatment protocol can be designed to restore functional movement and correct postural and mechanical deficiencies. At NYDNRehab, our foot pain specialists conduct a thorough analysis to identify and treat the source of your foot pain. We especially focus on movement mechanics, correcting deficient running and walking gait patterns so the foot and ankle move in more mechanically efficient ways. The foot pain specialists at NYDNRehab go beyond just treating your pain by correcting the underlying deficiencies that often lead to injury. Do not ignore your ongoing foot pain. Contact NYDNRehab today for complete analysis, diagnosis and state-of-the-art treatment.